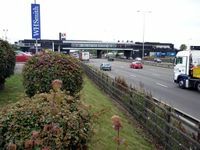 An online service area is one which is built immediately adjacent to the road it serves, so drivers can literally pull in straight off the motorway. This design is preferred over offline services. The biggest problem with this design is that the sliproads are often short and sharp as a result of the services being expanded over the years and it not being financially viable for the operators to realign them. Most of the UK's examples of this design have facilities on both sides of the road, but only because our services tend to handle large volumes of people. When the motorways were quieter, it was common to provide facilities on one side of the bridge only. Since 2008 there has been a preference for this design of service area. Until the 1970s, it was the only design used, unless there was absolutely no other option. As operators and developers were increasingly encouraged (and by 1992 required) to suggest potential sites for services, they would ask for this design to be built as it has lower running costs and attracts more traffic. 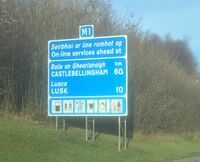 A sign in Ireland using the phrase "on-line services". In Ireland, the phrase is used publicly, with signs providing information about "on-line" and "off-line" services. Pages in category "Online services"